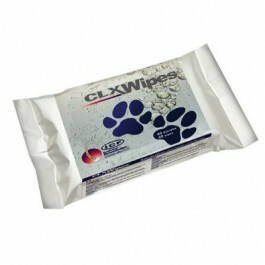 CLX Wipes are large, heavy duty wipes for daily cleansing of the skin, skin folds, and interdigital spaces of dogs, cats, and other small pets. 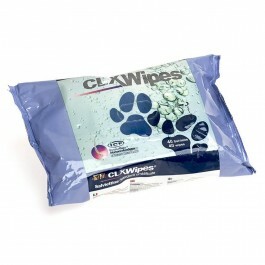 CLX® Wipes are large, heavy duty cleansing wipes impregnated with chlorhexidine, TrisEDTA, climbazole and zinc gluconate for daily cleaning of the skin, skin folds and the interdigital spaces of dogs. CLX® Wipes can also be used on cats and other small pets. for daily cleaning of the skin. for the skin folds and interdigital spaces of dogs. as an antibacterial to keep minor wounds clean and free of dirt. as a general cleanser after daily walks, particularly for dogs prone to interdigital irritation. Ideal for cats and other small pets. Each large Wipe can be cut into two halves if required. Chlorhexidine digluconate & TrisEDTA : chlorhexidine has an antibacterial action and has a synergistic effect with TrisEDTA. Zinc Gluconate cleanses, regulates and purifies the skin. Climbazole has an antibacterial and antifungal action and helps to regulate the turnover of skin cells. Glycerine is a moisturizing agent that protects the skin. Use against the hair growth. Do not rinse. Use one or more times a day, or when necessary.